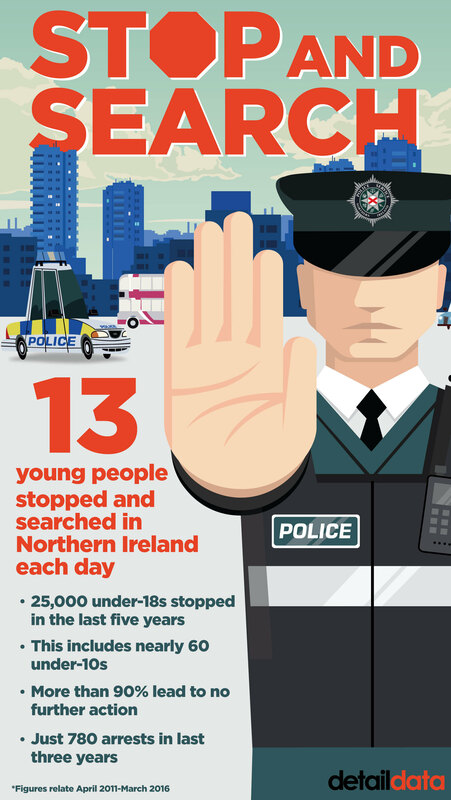 Police in Northern Ireland have used stop and search powers on under-18s nearly 25,000 times in the last five years, the vast majority of which did not result in any further action. A Detail Data investigation has found that between April 1, 2011 and March 31, 2016 a total of 23,323 operations were conducted that did not result in arrest - including 59 incidents involving children aged 10 and under. Although a small number of these incidents (2,070) led to some action - such as a caution, community resolution or report to PPS more than 91% resulted in no further police action. Stop and search powers allow police to detain members of the public using a range of legislation aimed at combating crime. The Police Ombudsman’s Office, which has received 370 complaints relating to the overall use of stop and search over the last five years, said it hopes to launch an initiative in the coming weeks to address the concerns of young people which it says: “Come up time and time again." “There is no restriction in law preventing the stop and search of under 18s therefore police officers will use their powers under stop and search when they have reasonable grounds to suspect an item is being carried to keep both that individual and the wider community safe,” a police spokesperson said. The police added: "In the vast majority of (security related) cases, stop and search is used as an effective deterrent. If terrorists know there is a chance they will be stopped by police they have less opportunity to move weapons and bombs and we know this has prevented terrorist attacks and saved lives." Despite this rationale, the findings have prompted fresh calls from the Northern Ireland Commissioner for Children & Young People (NICCY) and rights based charity Include Youth for a re-evaluation of the use of stop and search on under-18s and greater transparency in relation to why, where and on whom it is used. Children's Commissioner Koulla Yiasouma said young people from deprived backgrounds feel "they are labelled or discriminated against on the streets of Northern Ireland" by a range of agencies including the police. However, the PSNI insists the powers are used "properly, legitimately and proportionately in preventing and detecting crime". More than 160,000 people, of all ages, were stopped and searched in the last five years. This resulted in an arrest rate of less than 7%. Of the near 150,000 incidents that did not result in arrest, more than 23,000 were conducted on under-18s. This included nearly 60 on children aged 10 and under. Drugs and related paraphernalia were recovered in more than 1,000 searches on under-18s. This included the discovery of cannabis on a child aged 1-5 in 2013. Of the total number of under-18s stopped, 780 were arrested in the last three years. The Police Ombudsman has received 370 complaints relating to the overall use of stop and search powers across the community in this period. In just one case was an officer found to have behaved improperly. Commitments to record community background data have not been fulfilled, with a recent pilot scheme in Derry aiming to collect this information failing to receive a single response. Police statistics show that over 70% of stop and searches relate to regular crime, as opposed to terrorism or security related matters. Under the Freedom of Information Act, the PSNI provided data relating to 149,764 incidents of stop and search conducted on people of all ages. The police did not provide information on the 10,306 incidents that resulted in arrest, in order to protect ongoing investigations. Detail Data had also requested the community background of each person involved and the location in which the search was conducted. Both of these categories were refused. The PSNI did provide details of the much broader policing district in which each search was conducted. This confirmed that districts containing some of the largest urban conurbations – including Belfast, Lisburn, Castlereagh, Derry, Craigavon and Newry saw the most incidents. Instead the information was provided in age bands. 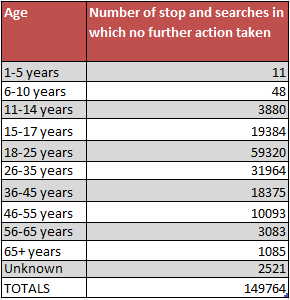 Previously the under-18 stop and search data had been collated in a single age category. However, in the data file provided to Detail Data this section had been further broken down in to four units. This revealed that there were 11 incidents with children aged 1-5; 48 on children aged 6-10; 3,880 on children aged 11-14 and 19,384 on young people aged 15-17. Although covered by a range of legislative powers, stop and search falls under two broad categories. The first relates to regular crime such as drugs, offensive weapons and stolen goods. The other type relates to security matters such as terrorism. Police statistics indicate that more than 70% of stop and searches relate to regular crime. However, the data provided by the PSNI did not indicate which power was used in each individual search. However, the Misuse of Drugs act is known to account for more than 50% of all incidents and analysis of the data provided reveals that drugs and associated paraphernalia (eg, syringes, bongs, grinders, deal bags) were recorded in more than 1,000 of the searches on under-18s. This included the discovery of cannabis and cash on a child aged 1-5 in April 2013. Although the PSNI did not provide arrest information, analysis of data published on its website, when viewed in conjunction with the information provided to Detail Data, reveals that in the last three years (2013/14, 14/15 and 15/16) a total of 14,671 under-18s have been stopped and searched with 780 subsequently arrested. This represents an arrest rate of 5.3%. In a response to this finding the PSNI said that it did not believe arrests always represent a positive outcome. “PSNI operates to keep people safe,” a statement read. “We do that through detection (arrest, prosecution) but quite often we prefer prevention and deterrence to stop crimes or harm to people occurring in the first place. “So the fact is that arrest is not necessarily a successful outcome for PSNI nor is it the only successful outcome. In many incidents we stop and search people, and in particular young people, to try and deal with the real issues of drug misuse and underage drinking. Despite the gaps in information made available, Paula Rogers, the policy co-ordinator for Include Youth, a leading youth advocacy organisation, said the figures raise important issues. “I knew of a few instances of under-10s but I never expected it to be just as substantial as that,” she said. “It really is a cause of concern for Include Youth as under-10s are under the age of criminal responsibility and yet we have children being stopped and searched on the street? Koulla Yiasouma, the NI Commissioner for Children and Young People (NICCY), said the number of incidents that do not result in any action is having a negative impact on young peoples’ relationship with the police. The Commissioner called for greater transparency in relation to the use of the powers. “I feel the return rate is woefully inadequate,” she said. “What stop and search achieves is the breakdown of the relationship between the Police Service and its young people and I don’t think this return rate justifies that breakdown of relationships. “The information we require is end to end. We need to know why the child was stopped, what happened immediately after the operation, if there was further action what that looked like and what it was for and what that outcome was. Queen’s University criminology lecturer Dr John Topping said the figures suggest that young people are disproportionately the focus of stop and search operations. “When we dig further into the figures in relation to the number of young people and particularly 15-17 year olds, they represent about approximately 4% of the NI population but about 11% of the stops and searches,” he said. Paula Rogers of Include Youth believes that young people feel that making a formal complaint about stop and search is not a worthwhile exercise. “Very few would even attempt to put a complaint in, they don’t see the point,” she said. This is something the Police Ombudsman’s Office, which has received 370 complaints relating to searches in all age groups over the past five years, says it is keen to address. “The issue of ‘stop and search’ is something which comes up time and time again in our regular visits to schools and youth clubs to explain how the police complaints system works,” a spokesperson said. “In listening to these young people it is clear that many of them do not understand their rights nor indeed understand the rights of the police officers. “We have been in discussions with the police about this problem and hope in the next few months to launch an initiative which might go some way to addressing the problem. Of the 370 complaints, 126 were fully investigated with 19 substantiating the complaint or identifying another issue of concern. In just one of the cases was an officer found to have behaved improperly. The overwhelming majority of searches involving young people (20,653) focused on males. In a statement the PSNI added that a 2015 pilot scheme aimed at collecting community background information following stop and searches in the Derry City and Strabane council area had proven unsuccessful. “Those who were stopped were given a pre-addressed card and asked to indicate their community background on it and place it a post box however PSNI did not receive any completed cards and despite other attempts to collect data we have been unable to find a methodology to collect and report on community background of all persons stopped that would stand up to scrutiny,” the statement read. Paula Rodgers said that although she does not believe there to be religious differences in the number of stop and searches on children she does believe that socio-economic differences are likely. “I don’t think it makes a difference in terms of religious breakdown,” she said. “It doesn’t matter if you are in west Belfast or east Belfast it is the same experience for young people. But we know that young people in certain areas are more likely to be stopped. “I think you are going to find it a lot more often in areas where there was conflict or where there is deprivation and anti-social behaviour. This sentiment is shared by the Children’s Commissioner Koulla Yiasouma. “The feedback coming from young people is that it is less about green and orange and more about, in their words, ‘posh and poor’,” Ms Yiasouma said. Police said the use of the powers can act as "an effective deterrent" against criminal activity. The PSNI added: "We have considered various indirect methodologies to capture and record certain pieces of information for example overlaying location data with census data which might give an indication of socio-economic variances but this methodology is totally skewed when we carry out operations at large scale public events. "We continue to work with our colleagues in GB through the National Policing College to explore ways where we can be more open and transparent but as yet we have not been able to develop practices which allow us to gather meaningful data." Dr Topping said that although the information provided gives an insight into some of the shortcomings of stop and search, further data is required in order to fully evaluate its use. “Arrest rates and outcomes of stop and search contacts broadly are one of the few measures we have accurately gauging the extent to which stop and search is a successful tactic. In its response the PSNI confirmed that it regularly uses stop and search in a bid to prevent crime both ‘regular’ and of a security nature. “We have a right and a duty to stop members of the public and to talk to them,” a statement read. “In certain circumstances we may require to search them. This is all done in order to help keep people safe through preventing and detecting crime, anti-social and terrorism. “We have processes in place to ensure that stop and search powers are used properly, legitimately and proportionately in preventing and detecting crime. “In the vast majority of (security related) cases stop and search is used as an effective deterrent. If terrorists know there is a chance they will be stopped by police they have less opportunity to move weapons and bombs and we know this has prevented terrorist attacks and saved lives." Details of items found are recorded in 1,720 of the 23,323 cases of non-arrest stop and search on under-18s. Data that was released included the discovery of cannabis and cash on a child aged 1-5 in April 2013. Other items included weapons, fireworks, alcohol and counterfeit goods. The database also recorded seemingly innocuous items such as hurling sticks, musical instruments and confectionary. Whilst acknowledging the level of drug material found during searches, Paula Rogers of Include Youth said this does not justify the wide-use of the powers. “I don’t think stop and search is the way to go about tackling the drug problem among young people,” she said. “It clearly hasn’t been shown to be making a difference – because we have a serious problem with drugs and young people. For more on the powers underpinning the use of stop and search click here. The data used in this project can be accessed here. An interactive calendar highlighting when incidents were recorded can be viewed here. The Police Ombudsman’s Office, which has received 370 complaints relating to stop and search over the last five years, said it hopes to launch an initiative in the coming weeks to address the concerns of young people which it says: “Come up time and time again." A total of 780 under-18s were arrested in the last three years as a result of stop and search. The Police Ombudsman has received 370 complaints relating to stop and search in this period. In just one case was an officer found to have behaved improperly.